NSC is happy to announce the addition of a new vehicle to our fleet: Engine 4457. 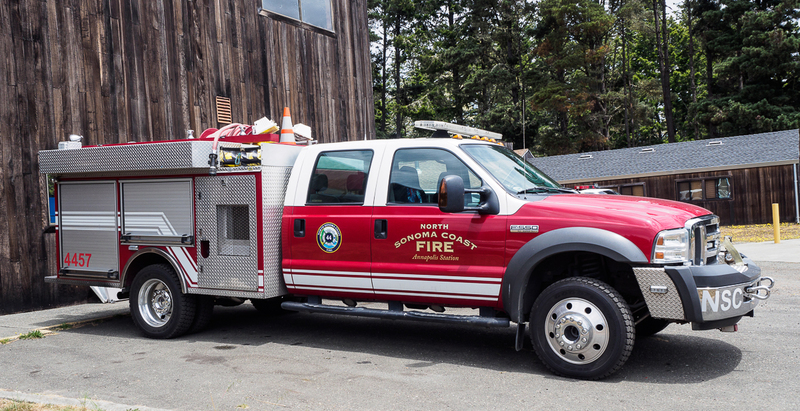 E4457 was purchased used from the Lake Shastina Fire Department in early June 2018, and should be in service by July. E4458 is a "type 6" engine, which is basically a heavy-duty pickup truck chassis with a small water tank, pump, and hose, plus a small compliment of rescue and medical gear. Type 6's are especially useful for quick first-attack on wildland fires in areas where larger vehicles may not be able to get access. A type 6 is the ideal vehicle for initial response in most of our District, east and uphill of Highway 1, where most roads are narrow, windy and steep and many are unpaved. As you can see from the pictures E4457 has not received its new NSC branding decals, but will shortly. See New NSC Apparatus for the full story of how the NSC fleet has been enhanced since the District was formed.